Riding around Haralson County in his 1988 Oldsmobile Cutlass, Meng Lim points out the places that serve as the historical markers of his life in rural West Georgia. The first house his family lived in when moving to Bremen, Georgia. The church whose congregation became like family to them. The elementary school he attended. The building that housed his first law office, now home to a pawnshop. Like his car — which he bought for his mother after graduating from law school in 1998 — these places are comfortable and familiar to him. 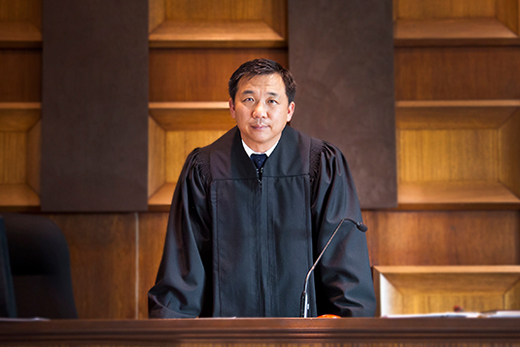 Last spring, Lim knocked on his neighbors’ doors throughout Haralson County and adjacent Polk County to stump as a candidate for superior court judge in the Tallapoosa judicial circuit. After a close primary election in May between Lim and Polk County attorneys Chuck Morris, Andrew Roper, and Vickey Atkins, Lim won a July runoff versus Morris to earn the bench. “Lim stood out most of all in his home county, where Haralson voters turned out more than 2 to 1 in Lim’s favor. Haralson County turned out 2,174 to 927 in favor of their hometown candidate,” according to local newspaper the Polk Fish Wrap. In Polk County, the tally was 1,812 votes for Lim to 1,544 for Morris. His campaign stood out partly because of the heavy use of social media, especially Facebook, by Lim and his supporters. Lim’s Facebook page lists his hometown as Bremen, when in fact he was born more than eight thousand miles away in Phnom Penh, Cambodia, in 1972. The youngest child of Se Lim, a school principal, and Anh Hue Tran Lim, a nurse, his family’s journey to the United States began in 1975 after the Khmer Rouge seized control of the country.